Coincidence is rather interesting. Sometimes is can be strange, eerie, or funny. I wonder if there is some way people pick up other’s thoughts or if there is a foretelling of something to come. It’s like when you think of a song and then a few hours later it plays on the radio. The other day I was at the store getting groceries. As the guy was taking my bags to the car, he said “Chinese New Year is February 19th”. It just so happens my plan for the afternoon was to make and photograph these Purple Snow Peas with Sunflower Seeds. So why is that a coincidence? Well, the kind folks at Frieda’s had sent them to me for their February inspiration of Chinese New Year. They also sent some lovely Asian pears and Opo squash. Snow peas symbolize unity. Things are united with coincidental occurrences. Anyway, it made me smile when I wondered how in the world the guy picked the one thing to say that was on my mind. Purple snow peas have such a nice color. They can be eaten raw or served with dips or in salads. Cooking them only takes a couple of minutes. You want them to stay crisp. They are great for stir-frys and other quick-cooking recipes like Thai Shrimp Curry. This time I wanted to make them the star of the dish. 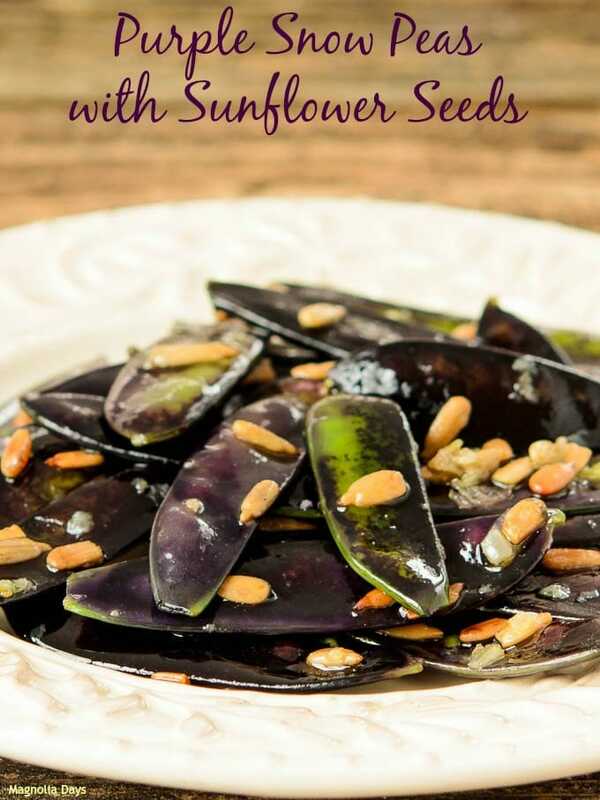 I decided to quickly cook them with butter, olive oil, shallots, garlic, and sunflower seeds. Why sunflower seeds? I had them in my pantry and thought how nice “peas and seeds” sounds. The flavor combo works too. Note I did use shelled seeds (kernels). Purple Snow Peas with Sunflower Seeds is a quick and easy recipe that only takes about 10 minutes to make. 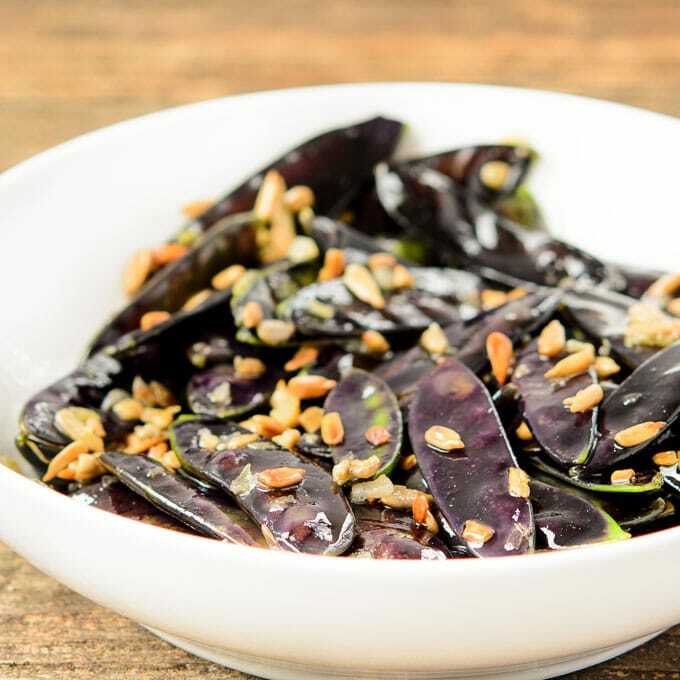 It is a great side dish or can be a snack too. Heat butter and olive in a large skillet over medium high heat. When the butter is melted, add shallot. Cook until softened, about 2 to 3 minutes, stirring occasionally. Add garlic and sunflower seed kernels. Stir and cook for 1 minute. Add snow peas and cook for 1 to 2 minutes, tossing occasionally. Do not over-cook or the snow peas will become limp (you want them to have a crunch). Disclosure: I received a box of assorted produce from Frieda’s at no charge. I was under no obligation to post a review. All opinions are my own unless otherwise stated or contained within a guest post. 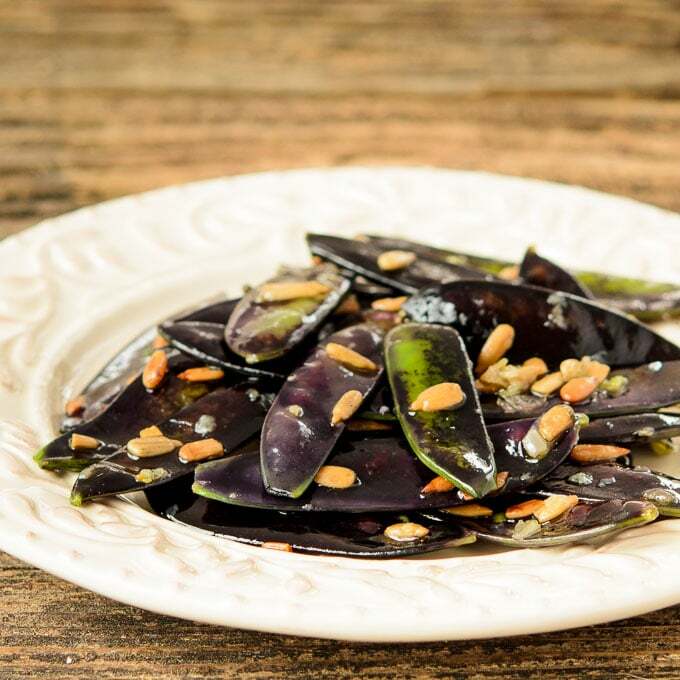 I haven’t seen purple snow peas available here in Australia but I definitely can still make this side dish with regular green snow peas. Love how delicious it is.. such a great way to cook veggies! I can’t get over the colors! Nature is incredible.